Leanne is a life-long Dedham resident and previously worked at Gates Pharmacy, Oakdale Pharmacy, and Wardle Pharmacy. She is a graduate of Dedham High School and Massachusetts College of Pharmacy. She is Chairperson on the Board of Health in Dedham having served for 20 years. She also Chairman of the Council on Aging in Dedham and Co-Chair for the Dedham Coalition for Alcohol & Drug Awareness. Her passion for health and elder advocacy shows through in her everyday work and volunteering. 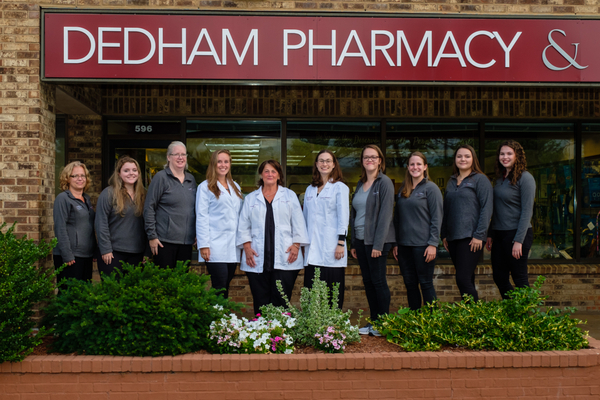 Leanne opened the 100% independent Dedham Pharmacy & Medical Supply in July of 2016 and strives to make it "what a pharmacy was meant to be" every day. She enjoys cooking and spending time with her family and relaxing at the beach. Carolyn grew up in Needham, MA and attended Ursuline Academy in Dedham. She worked at Wardle's Pharmacy in Dedham Square from 2007 to 2014 and at Mocha Java in 2013-2014. 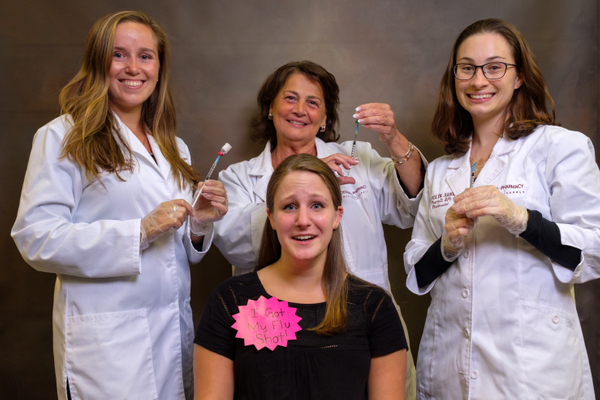 She graduated from MCPHS University in 2014 with her Doctor of Pharmacy degree. After graduation, she migrated south to complete a 1-year residency in Clinical Veterinary Pharmacy at North Carolina State University. She also works part-time at Tufts Cummings School of Veterinary Medicine in the pharmacy. Carolyn enjoys spending time hiking with her standard-poodle "Tupper" and sewing. She is thrilled to be a part of this wonderful team of staff! Julia grew up in Framingham, MA where she attended Framingham High School. She graduated in 2017 from Western New England University with her Doctor of Pharmacy and Masters of Business Administration degrees. She has worked at Nashoba Valley Medical Center as a pharmacy intern for 6 years where she currently works as a pharmacist. In her free time she enjoys running and hopes to run the Boston Marathon in the future. She also enjoys spending time at the Cape with her family and her dog Bentley. Kim is a life-long Dedham resident who previously worked for Oakdale Pharmacy and Wardle's Pharmacy. Along with her Pharmacy Technician duties, Kim fills many roles here at Dedham Pharmacy including (but not limited to) front window decoration, gifts and cards ordering, and all home-health care product ordering. She has two sons and enjoys the beach and spending time with family. Donna came to us from CVS in Dedham Square where she worked for 19 years! She is thrilled to be part of an independent pharmacy now and enjoys working more closely with her patients. During her time off, she loves spending time with her three beautiful grandchildren. Marissa is a junior at Northeastern University where she majors in Public Heath and Health Science with a minor in Biology. She is a life-long Dedham native and graduated from Ursuline Academy in 2015. In her spare time she enjoys playing with her puppy "Jesse" and also hiking in New Hampshire. Jacque graduated from Norfolk County Agricultural High School where she majored in research animal technology. She is a horseback rider and loves to spend time with her dog "Jake". She is currently enrolled at University of Vermont. Katie just graduated from Dedham High School! She enjoys spending time with friends and family and going to Cape Cod. She is enrolled at Massachsetts College of Pharmacy and is majoring in Pharmacy. Johnny is a Hyde Park resident and previously worked for the "T" in Boston as a bus driver. He enjoys spending time with his children, many grandchildren, and dog "Homer". Abby just graduated from Dedham High School. She enjoys spending time with her 2 dogs, adorable bunny, and her family in New Hampshire. She is enrolled at MCPHS University and is majoring in Nursing. Kelly is a lifelong Dedham resident who enjoys spending time with her two children and fiance. Chanelle is a senior at Dedham High School. She enjoys playing volleyball and piano and spending time with her family. She is very excited to complete her last year of high school.